Preheat oven to 425 degrees F. Cut the potatoes in halves or quarters. 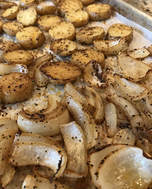 Place potatoes and sliced onions in a bowl with olive oil; Toss until potatoes are well coated, sprinkle 2 tablespoons Spicy Coffee Rub and toss until well coated. Arrange potatoes and onions on baking sheet in a single layer and cook for 25 minutes; flip once during cooking to ensure browning on all sides.